Taking a ride on one of the many Seattle ferries in and around the area is something we never knew would make our kids so happy. But riding on the ferry is always one of the highlights of our trip to Seattle. Because Seattle is located on the coast, ferries are heavily used to get people from one side of the Puget Sound to the other. People not only use them to get to and from work, but to get away from the city and spend some time relaxing a little. There are twenty different ferries that are operated by the Washington State Department of Transportation and depending on where you are and where you want to go will determine which one is best to take. The Washington State Ferries page has all the information on the ferry system that you can use to travel around the area. There are many things that kids enjoy about riding the ferry. First of all, most kids have never been in a car driven onto a ferry. It's neat to see all the cars that can fit on the ferries and kids will be amazed. Second, there's enough time for you to get out of your car and walk around the ferry, looking out all the windows and even going outside and seeing the water pass by. You might even see some wildlife en route (or at least other sailing vessels). Third, you never know who you'll run into while riding the Seattle ferries. 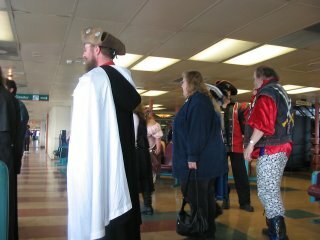 Last time we rode the ferry, there were a bunch of people dressed up like pirates handing out "gold coins" to all the kids. 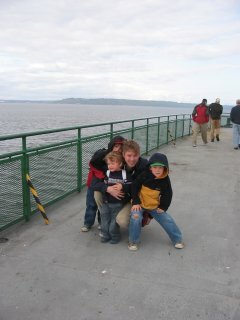 So be sure to take advantage of the ferries in Seattle and it's sure to be a hit with the family.